Does the world take the training of its human capital seriously? Estimates[i] suggest it spends $300 billion per year on a total population of 7,400,000,000. [ii] That works out at about 4 cents per head (maybe 8 cents per person of working age?). If that figure were doubled overnight would it signal that training is being taken any more seriously? Increasing the cost does not necessarily mean training is more highly valued. Turning training cost into training investment is the real game changer because, by definition, an investment is expected to appreciate in the future. Therefore, training can only be said to be taken seriously when someone calculates its long-term impact in value terms. 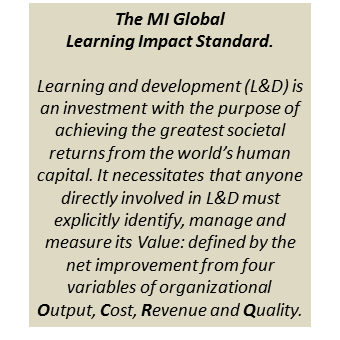 That is why MI is very proud today to announce its Global Learning Impact Standard; against which all future governmental and corporate training spend will be judged. No longer will corporations be applauded for incurring the highest training costs. For those who work in the field of learning and development (L&D) this is an auspicious day. MI includes all learning in its standard. It is the standard on which MI’s ground-breaking Prague Programme will be based, when it begins in 2017. Anyone aiming for the highest professional standards and wanting to take learning impact this seriously is welcome to join us (from anywhere in the world). Apart from helping you to become an MI Affiliate, the Prague Programme will teach participants how to capture the full value of organizational learning; in terms any CEO should be able to fully understand and support. It focuses L&D on the organization’s outputs and revenue as well as the quality of its products and services. 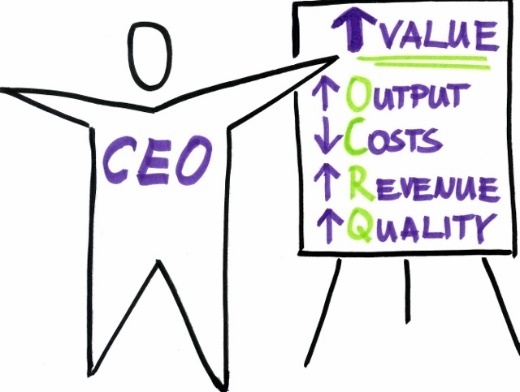 The perception of L&D as a cost, in isolation, actually devalues it. So we will be teaching how to calculate the real, net return on investment after factoring its costs into the total value formula. It is inevitable that this new MI standard will challenge global thinking about learning. Those corporations, governments and national economies that learn this crucial lesson are bound to gain a significant advantage over competitors who are only interested in counting the cost of inputs. MI’s goal is maximum societal value and when all governments start taking learning this seriously, because they can see its value for their economies, the global cost of learning might soar well above 8 cents but the net returns for the world’s population will far exceed present expectations. *MI is a learning organisation and our worki is constantly evolving. If you believe there is a higher global standard than ours then please let us know.